Sony's "Play Create Share" initiative picks up speed with the debut of ModNation Racers for the PlayStation 3, a kart racing title that lets you build the track, the kart, and the racer. United Front Games has plenty of experience building racing games, and they want to deliver that sort of power to the player. Creating a kart racer that combines the popularity of custom vinyl toys with the ability to fully realize your own race tracks and share them online with other players, United Front takes the charming versatility of Media Molecule's LittleBigPlanet in a completely new direction. I sat in on a demonstration of the game this morning, and while the racing itself isn't particularly intriguing, getting there is something else. What I attended was basically an extended version of what United Front presented during Sony's E3 2009 press conference, with a much greater focus on the creative design aspects of the title. On the most basic level, Mod Nation Racers is your basic kart racing title. Players race around the track, using weapons and power-ups to help them be the first to cross the checkered line. Creating a racer, however, could take you quite a bit of time. Players can either start out with a pre-made character or start with a blank template resembling a vinyl toy. From there, the player can craft a competitor that is truly unique to their personality. As the demonstrator flipped through the options, I saw more than a hundred eye choices alone, with lips, nose, hair both polygonal and painted, clothing, and accessories making for a character creation process that could very well be more involving than the race itself. The demo glossed over kart creation, as many of the assets were not yet in place. There were still several options available, mostly resembling mini-versions of sports cars and trucks, with a few novelty choices thrown in for laughs. 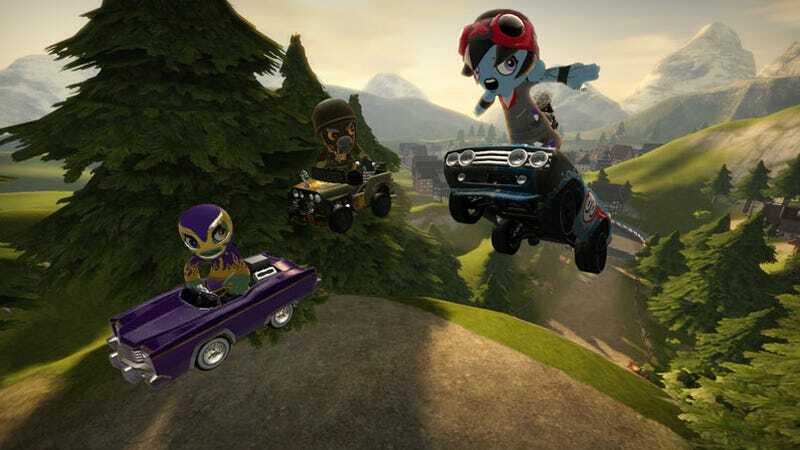 The player can create a wide variety of vehicles with different handling properties, once again reinforcing the creative customization options that ModNation Racers seeks to deliver. Once you've got a racer and a car you can take a shot at the game's pre-created courses, or you can see if you can do better. After all, the developers used the same tools the players will use to create the racers, karts, and tracks that come in the game. Creating a course is as easy as driving as a circle. You start with a large flat plain, and to place the road you simply drive your tool around. Crossing over other bits of track automatically creates ramps and bridges, so once you've completed your circuit you can immediately drop in and start driving...but why stop there? The guy demonstrating the game quickly changed some of the road surfaces to dirt or cobblestones, popping back in to demonstrate how the car handled different on such surfaces. Then he began raising and lowering the terrain, quickly creating mountains and lakes around the track using a simple targeting reticule that can be widened or narrowed depending on how much modification you desire. Another tool painted trees onto the landscape, foliage popping up in almost comic fashion along the sides of the track. Each tree that appeared on the track was its own object, able to be moved and adjusted separately of the rest of the trees. Around the cobblestoned areas he picked a different tool, painting various buildings along the track. Popping back into his kart he drove past the buildings, tires rumbling along the cobblestones as he rolled by. Back into edit mode he painted a dirt trail from one section of the track to another, and suddenly a shortcut was available. By the end of the session he had added a corral of sheep, random power-ups, some plastic furniture along the side of the road that scattered onto the track as he plowed through it, and some rocks along the edge of the track for texture. In about a half hour, he had created a track that would take days to create using regular developer tools...and all this will be accessible to the player. The only limiting factor will be a resource tracker, much like the one in LittleBigPlanet, that warns the player when they start pushing the system's resources. It was a very awe-inspiring demonstration, but I fear that the balance between the joy of creation and the enjoyment to be found in the actual racing might be off by a large margin. The racing itself, as I said, seemed rather bland, and the frame rate was rather disappointing. Still, this is an early build, and ModNation Racers has a great deal of potential. Perhaps the amazing variety of creative options and the personality bursting from the personalized vinyl racers will be enough to carry the title to greatness.